The thumbs up is a hand gesture achieved by clenching your fist and pointing your thumb upwards. If you give the thumbs up you are showing your support or approval of someone or something. Watch the video below to see Richard Ford (Q Language English teacher) demonstrate giving someone the thumbs up and explaining how you might use this common English expression. Idiom of the day! To give some one the thumbs up. 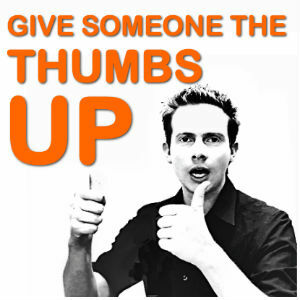 To give someone the thumbs up means that you give them your approval. This is giving the thumbs up. So if you’ve given the thumbs up to somebody it means you’ve given them your approval. It could also mean that you think something is very,very good. “I give the movie a big thumbs up!” So please give us a thumb up on You Tube and I’ll see you very,very soon. Thank you. 1. Jane asked her her new boyfriend if he liked her new hairstyle. He just smiled and gave her a thumbs up. 2. Q Language Chinese courses get the thumbs up from students worldwide. Please be careful who you give a thumbs up to or where you give it – you could be committing a serious foreign language faux pas! In some countries and in some cultures giving someone the thumbs up is considered the worst possible insult and it could get you into a lot of trouble. For more details, read this Wikipedia article. I give Richard the thumbs up!